Christmas is not a public holiday in China as it is in Singapore and many parts of the world. Although New Year is a public holiday, it is not as important as Lunar New Year. So both days are subculture holidays. There were 3 adults (Nic & wife, Hillary and myself) and an almost 2-year-old baby (Maranatha) on this trip. Our luggage weighed 75kg because we hand carried a brand new set of electronic drums for HBI (Hunan Bible Institute) for use of their weekends outreach trips to the various churches outside of the city. We nearly missed our high-speed train from Guangzhou to Changsha. In our mad rush, one of our luggages (thank God it is not the one with the drums) tumbled down the long escalator. The long escalator was completely empty as ALL passengers were already on board the train! We made it in the nick of time. Once we stepped into the train, the doors were locked and it started moving. Phew! Thank God for his protection as Hillary is 5months pregnant carrying the 2 year old Maranatha in the rush, and Nic was carrying the electronic drums (weighing almost 40kg). 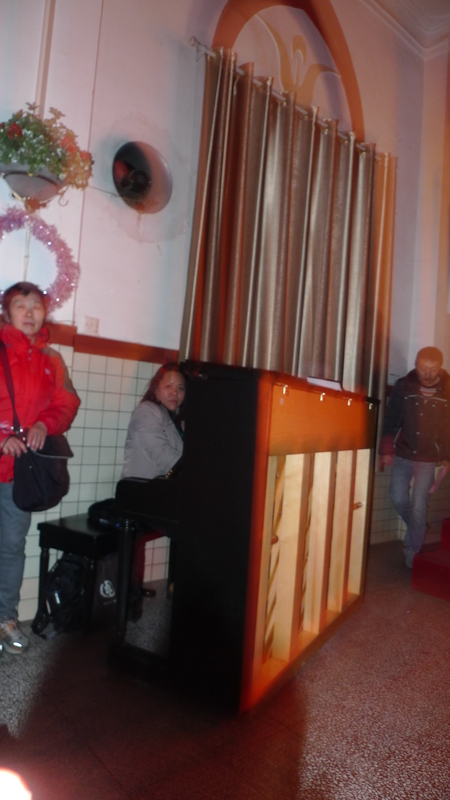 Christmas in Changsha was a very different experience. First thing was the weather! Temperature was around 0 degrees. Although there was no snow, but the wind was bone-piercing cold and extremely dry. I completely lost my voice on 27 Dec! The students of HBI put up an amazing evangelistic Christmas Concert on Christmas Eve. With little resources of time, manpower and finances, the concert was extremely good and makes me wonder if we in Singapore are able to match up to them if given the same amount of limitations. The hall was packed to the brim with many squished at the doorway throughout the evening. I didn’t keep my seat and was standing all the way taking photos and videos using my iPhone (eventually ran out of memory)! I was actually too excited to sit and just so very very proud of each of them! I am so blown away by the demonstration of their love for God through the hard work they put in to perfect their presentations that evening. I was told they only had about a month or so to prepare for this concert. About 30 people accepted Jesus as their Lord and Saviour that evening. Praise the Lord!! You can see snippets of their performances in the video. 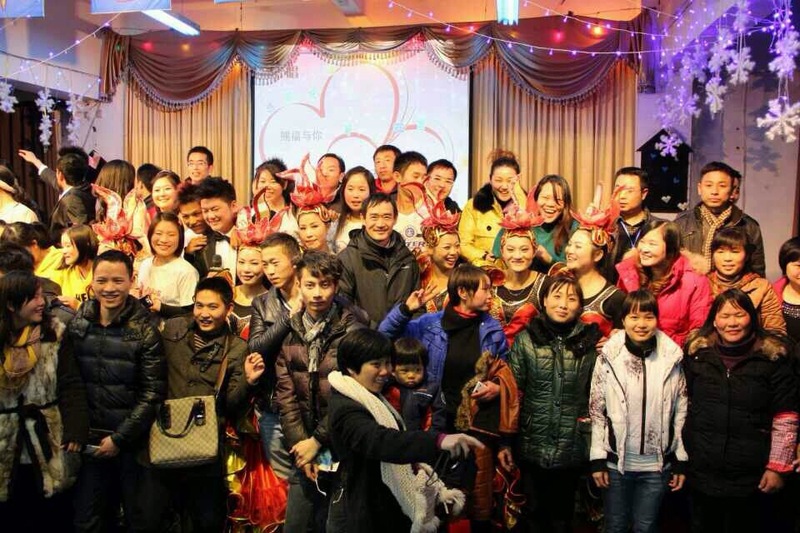 A group photo with HBI students after the Christmas Eve Concert. The atmosphere was super joyous!! Part of the plan of our trip is to track down Hudson Taylor’s mission work in China. Quite a large portion of his work was in Changsha, the inland, which is why his ministry was first names, Inland China Mission. To our surprise, on 23 Dec we were told that Nantang Church (南堂), which was the church planted by Hudson Taylor and is the appointed custodian of Hudson Taylor’s archives in Changsha, invited us to lead worship on 25 Dec evening during their Christmas concert. The church leaders never met us before. Blown away by the grace of God we gladly rushed through the preparation. We are so thankful for the full support by HBI. With the limited resources, and students all spread out to various churches/events doing various work, HBI staff and students brought sound board, cables, instruments, and the basic necessary equipment to support the 30min worship. The team went to the church at 12pm to assess what was needed and brought in the equipment past busy and jammed traffic on taxis. Contemporary praise and worship is very new to this church. I salute the whole team in tearing down all the equipment within 10min immediately after the worship to clear the stage area for the Christmas program after, also HBI needed the equipment for other events that same night! We praise God that the church’s ministry worker Mr Jiang was so appreciative of the session. Last minute I was roped in to play the piano for a solo item by their choir master who is about 70 years old who initially was going to sing acapella. A little fearful but am glad I can serve the Lord in this small way. Photo taken after the Christmas concert at Nantang. On the extreme right is Nantang staff worker Mr Jiang. In the middle is Esther who runs a travel agency that focuses on trips to Israel. Extreme left is a 2nd-year student at HBI and Nic, second from the left. 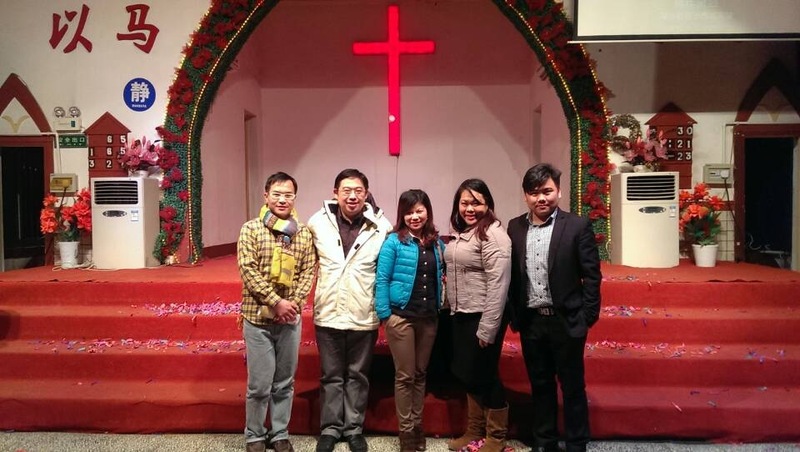 We also visited another key city church Changsha, Beitang (北堂) Church. The Taoist architect of the church building is a very good example of missions that is sensitive to the local culture and arts. Possibly a heritage left by Hudson Taylor, a missionary who ate local, dressed local, spoke local and even behaved local. Praise God for a good relationship built after a nice long chat with their senior pastor (although I didn’t have any voice to speak!). 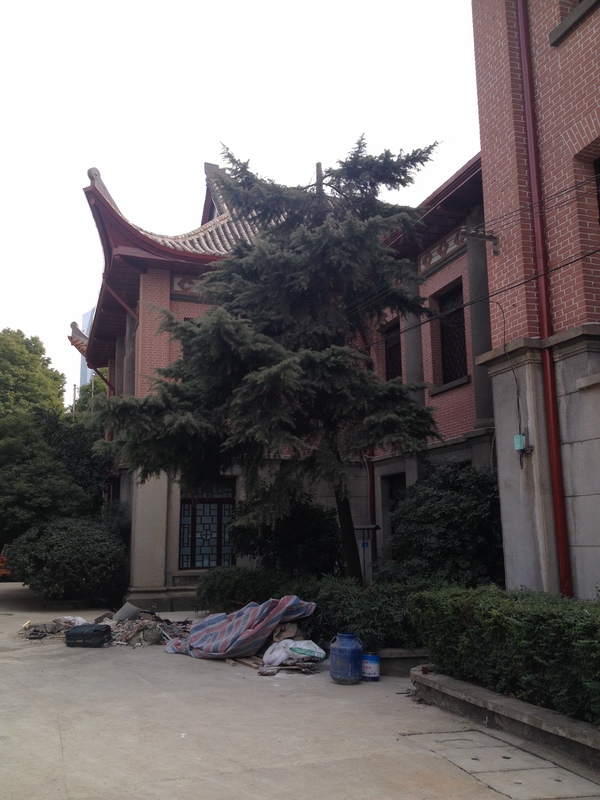 This is the side of Beitang church building. I would not be able to tell that it is a church if I was not informed. We did a very short teaching on 27 Dec morning in HBI. The students were all tired from the Christmas events and also needing to prepare for their exams in January 2014. We spent more time fellowshipping over meals with a few of the teachers, students and friends, which we did not manage to do this September due to the packed teaching schedule. I am filled by the time in Changsha, overflowing with God’s love and grace! What an awesome way to spend my Christmas. We took the high-speed train to Guangzhou with a lot less luggage and without rush on 29 Dec. Guangzhou was intended to be a vacation stop and to meet with a few friends there. One of them was a graduate from HBI, Pastor Ou. We also met a lovely musician couple, Gong Zheng and wife. Gong Zheng is a flutist who plays not only the mainstream Chinese wind instruments but also some of the almost lost indigenous instruments from Yunan. You can enjoy a musical piece by Gong Zheng at the end of the video.